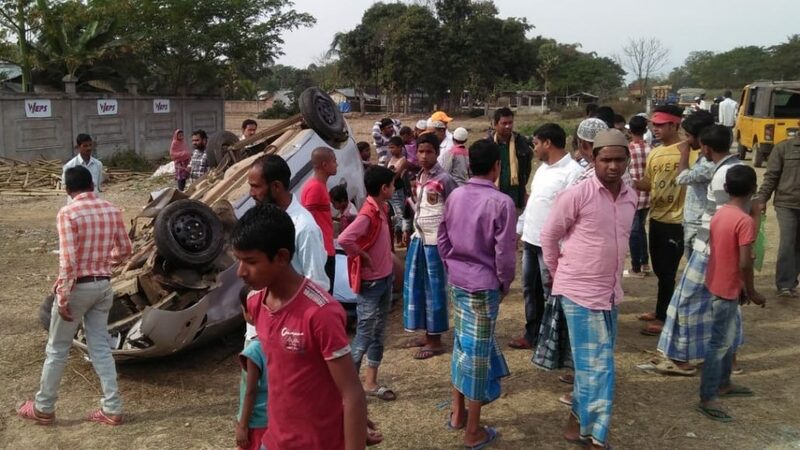 One person was killed and five others sustained serious injuries in a road accident near Nilbagan Chanapatty in Nilbagan of Hojai district along the National Highway 54. The accident took place at around 2 pm on Friday, when a Maruti Alto (AS 02- D1111) was going towards Nagaon from Nilbagan, suddenly the driver of the Alto car lost control and collided with an auto rickshaw bearing registration number AS 02 AC 4253 which was going towards the same direction and capsized. As per information, Nur Ahmed of Binnakandi in Jamunamukh who was driving the Alto Car, died at the spot. And five persons — Mubarak Batir, Abdul Gafur, Rita Biswas of Nandlalpur, Pradeep Das of Bhalukumari, Ramesh Namsudro and Ashwad Ahmed –travelling in auto rickshaw were injured. With the help of local villagers Police immediately admitted the injured to Mahatma Gandhi Adarsha Hospital. Meanwhile, critically injured Ashwad Ahmed was shifted to Hojai’s Hamm Hospital. On the other hand, the deceased Nur Ahmed’s body was sent for post-mortem at Bhogeswari Phukanani Civil Hospital in Nagaon.